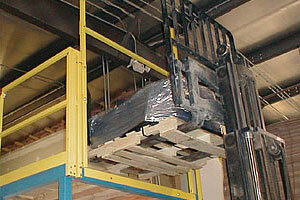 Simply forklift your pallet of material through the self-closing pallet gates and back away. The gates rest against your material until it is removed from the opening, at which time the self-closing pallet gates will close. Each gate is closed by three stainless steel torsion springs. 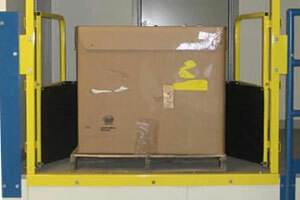 The high impact bumpers protect your material from being damaged while being pushed through the gates. The adjustable cross bar provides both a physical and visual barrier, as well as a grab surface for added safety. The self-closing pallet gate comes complete with gates & bumpers factory mounted to the vertical posts, railing mounting bracket, cross bar, base mounting angle and mounting hardware. Available in powder coat safety yellow enamel on carbon steel, or stainless steel. 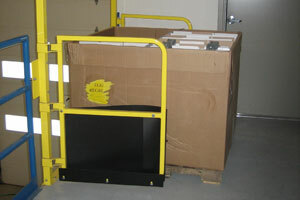 The self-closing pallet gate in the closed position offers full-height edge of mezzanine protection with its 42" top-rail, mid-rail, and adjustable 4" toeboard.